subroutine Trash 1 AI program. subroutine Do 1 net damage. Writing a program that can pass the Turing test is easy. The Gibson-Akamatsu test is a higher bar, and the only AIs to clear it thus far have been the androids. Even some humans have been known to fail. With Eater coming out next year, you will likely be seeing many more of these. Against non-Eater decks, this card is similar to a Data Mine but more expensive and can be broken more easily. Personally, as a primary Jinteki player, I will definitely use more of these in my deck. Anarch has some very nice AI breakers now with Eater out. They weren't really hurting for them before with Darwin and Knight. Also considering Atman and Crypsis and this card just got a lot more relevant. Throw a Sub Boost on one of these. As long as you're busting up their AI you might as well end the run also. For corps that are tired of getting their Ice walked over by AI breakers Swordsman may seem really exciting at first glance. At 1 influence this seems like an easy splash for any faction and also an easy include for Jinteki as well. In practice Swordsman does not deliver. Against decks that do not use AI breakers, Swordsman is a 3 to rez Str 2 Sentry that says: Do 1 net damage. can play a Str 3 Architect for 4 and 1 "influence" (NAPD MWL). Rototurret is another possibility that works against all programs. has Pup for 1, Cortex Lock for 2, Gemini for 3 or Neural Katana for 4. If you really want to land 1 net damage you may as well play Data Mine for 0 or Neural EMP. has Caduceus and Shadow in faction for 3.
has Gutenberg or Datapike for 2 or Data Raven for 4. But what about decks that do use AI breakers? In almost every case they will be escorted by Mimic, Mongoose, Faerie, Femme Fatale (to target Tollbooths etc. ), GS Shrike M2 or some type of Parasite/Datasucker insta-kill combo. In the very rare cases where you can actually land the "Trash 1 AI program." sub they will be recovered within a turn or two using Clone Chip, Test Run, Special Order, Déjà Vu or some other type of recursion. However even if you manage to kill the AI breaker, you will not have ended the run. Not ending the run can be a big deal if they land an Account Siphon or multi-access. So if Swordsman is effectively useless against decks without AI breakers and unlikely to get results against decks that DO use AI breakers what can you do about runners who use an AI as their main breaker? Wraparound is an all-star performer at taxing runners trying to get through with just Parasite+Datasucker or AI breakers such as Eater, Faust or Darwin. Wraparound won't stop Knight but you can kill a Knight by installing another Ice over Wraparound in order to Trash Wraparound. If you try this watch out they don't recur the Knight with a Pawn. The usual result of rezzing Wraparound is forcing the runner to install Corroder, Cerberus "Lady" H1, Inti, Breach or spend a D4v1d counter to break. 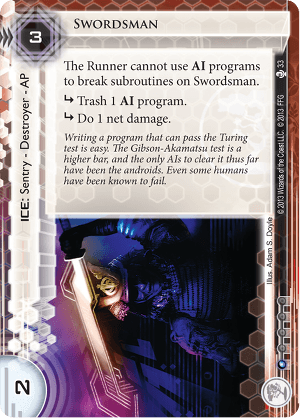 Turing is a fantastic card that is amazing against AI dependent runners. It is even reasonable against runners who use normal breakers (unlike Swordsman). If you have multiple Turings you could use one on a central server if you need it since it doesn't matter what strength it is if the runner cannot break it. Please note that on a central Turing can be vulnerable to Parasite and on a remote Turing can be broken by D4v1d. Double stacked Turings cannot be clicked through (barring Hyperdriver madness - although it's a sorry Runner that can't beat a Code Gate). Keep in mind that Turing is vulnerable to Inside Job or DDoS if it is the outermost Ice. Mess with runners who are willing to spend the each turn by installing time wasting assets and upgrades in your Turing server turn after turn while spending your other 2s to build up your economy and board position. Keegan Lane will kill that AI if you can tag the runner (Data Raven is one possibility). Aggressive Secretary will also kill the AI and it's friends as well (Goodbye Keyhole). A good, cheap counter to the ever-popular Atman+Datasucker combo. It becomes even better if your opponent was relying on the two exclusively as their primary breaker. At one influence, it is also a good card to splash into other, non-Jinteki decks as a way to counter, but has low overall strength.